Today, 12 July 2017, LiteSpeed web server provides the first production-grade QUIC implementation available for the public. Since Litespeed is part of our infrastructure, we are happy to introduce the support for QUIC protocol that will be enabled by default in next 24 hours on all WordPress sites hosted on our platform. Yes, we need first to test if this is stable version even Litespeed says it is stable. Google wants to speed up the web with its QUIC protocol, and we also want to improve your WordPress sites. 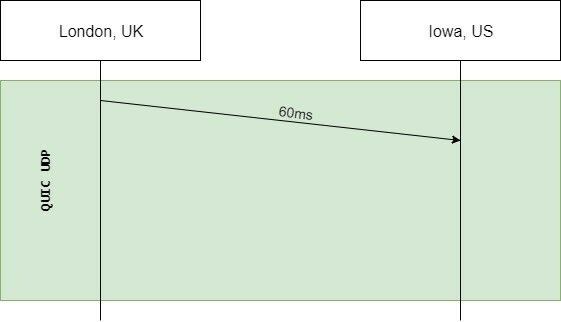 You gain an impressive edge over your competitors by serving applications over QUIC, and a site that loads in half a second now could load instantaneously over QUIC! Currently, all the web traffic works over TCP protocol. Your browser before starting a new connection to the server needs to exchange some information three times, known as a 3-way handshake and a few more packets for HTTPS handshake. That’s why opening an HTTPS connection over TCP have a delay. As much as visitors are coming from a far away distance, this delay can be so long, sometimes even seconds. UDP is more like a fire and forgets protocol. A message is sent over UDP, and it’s assumed to arrive at the destination much faster compared to TCP. The benefit is less time spent on the network, but the downside is that packets delivery cannot be validated. So, something has to be built on top of UDP to confirm packet delivery, and that’s where Google’s QUIC protocol comes in. Two packets if the browser is connecting to an unknown host. In real life, this is when some visitor discovers your website. One packet if the browser is connecting to a known host. In real life, this is when a visitor already visited your site at least once. There are also other benefits, think of when you browse some site with your mobile using WI-FI, but your connection is switched to LTE. QUIC has implemented its identifier for unique connections, and it’s possible to go from WiFi to LTE and still keep your connection UUID, so no need to renegotiate the connection or TLS again. QUIC is quite a new protocol, and not all browsers support it. Google Chrome has its support and enabled by default. Also, Opera has the support, but you need to enable manually. 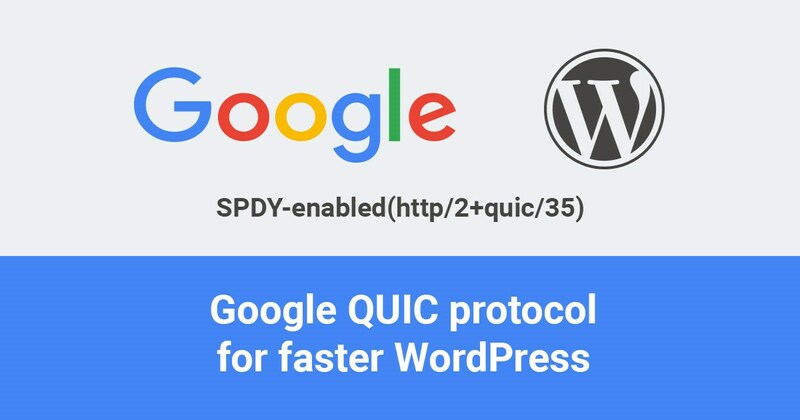 Once we activate QUIC on your sites and we hope this will be in next 24 hours, download “HTTP/2 and SPDY indicator” plugin for Chrome and open your site via HTTPS. 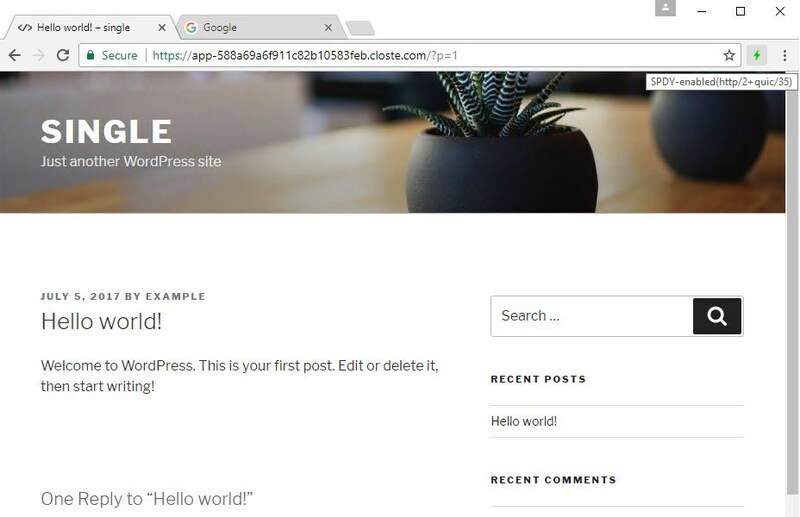 On the top right corner, you will see information which tells you what type of protocol was used for communication between your browser and your WordPress site.